As I said last time, this past weekend I was lucky enough to get together with two brothers and a sister for an afternoon and evening of visiting and as is normally the case in most families I know, vast quantities of really great food. The occasion was my brother and his wife, in from California for a brief visit. Family, good food, good conversation, it was a truly delightful visit. 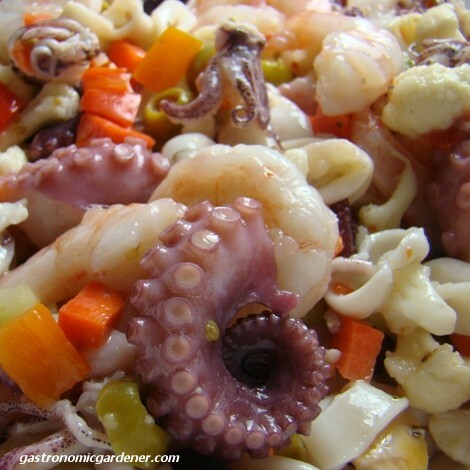 I told my sister, the hostess, that I would provide the antipasti tray as well as some Insalata di Frutti di Mare. (Sorry Mark – I know you don’t like it). The day before I went to the market and picked up some coppa (dry cured pork neck), prosciutto, Genoa Salami, an assortment of olives and fresh mozzarella to go with the stuffed peppers, spicy green beans, and marinated mushrooms that I prepared. I also swung by the fish monger for some shrimp, calamari, octopus, and mussels for the Insalata. The secret is to cook each ingredient separately briefly in boiling water then plunge in ice water to cool, the seafood came out perfect! I’m telling you, if you leave hungry it’s your own darn fault! Until next time, Eat Well & Keep Digging. My prejudices about seafood notwithstanding, that looks a spectacular plateful! Are your siblings equally interested in food? (I hope so). Thanks Mark, perhaps not as interested as I am, but certainly enthusiastic! Your antipasti would have been at home if served in any trattoria in Italy. Well done, David. You put together a wonderful assortment of flavorful foods that tempt the eye as well as the palate. Thanks John, I consider that high praise from an expert! The next step is to actually produce the charcuterie.